OCCC police respond to a wreck after the driver of a pickup lost control on neighboring I-44 and eventually crashed onto the west side of campus. Click here to view more photos. 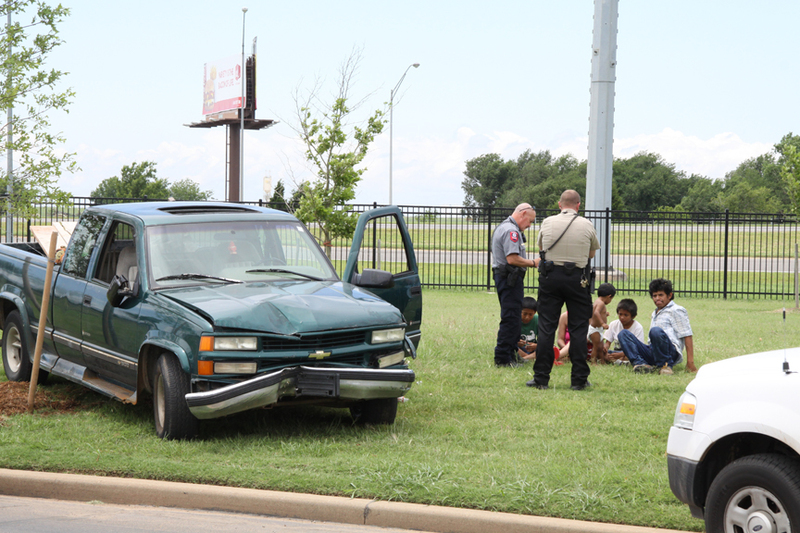 At approximately 1:45 p.m. June 13, an unidentified male lost control of his Chevrolet 1500 pickup as he drove northbound on I-44, crashing through OCCC’s steel perimeter fence on the west side of campus. The truck entered the campus near parking lot D and came to a stop near the VPAC Theater construction area. It appeared the truck exited the highway about 200 feet from the fence and went through it, bending back a section and carrying another section almost 20 feet from the impact point. The vehicle then grazed one tree and hit another head-on, snapping it in half and carrying branches up to 45 feet from the impact before stopping a few feet short of Faculty Circle, the street that runs the perimeter of the OCCC campus. Also in the vehicle were three male minors and an adult female. There were no apparent injuries and EMSA was not on the scene. Oklahoma City Police Sgt. Marvin Smith said the loss of control occurred because of a mechanical failure. The driver and passenger declined comment.